I admire women who carry small purses, but I am not one of them. When I leave the house, even if it’s only to drop the kids off at school, I carry a satchel of sufficient size to see a more streamlined traveler through several time zones. (It’s my Eastern European heritage: every time we leave a place, we prepare to be away for several generations.) 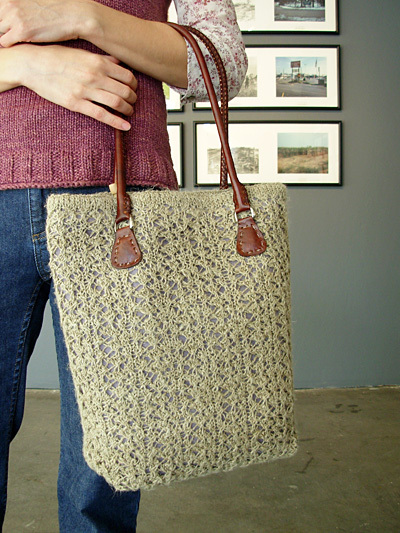 I console myself by trying to carry a bag that is stylish and interesting—and by reminding myself that women with small purses certainly do not have at hand the makings for several pairs of socks, a sweater sleeve, two scarves, a drop spindle, and yak down. Brighton is knitted in a simple Shetland lace pattern, in the round from the top down, and ends with a gracefully shaped bottom gusset and a three-needle bind off. This bag will serve as a constant reminder of your spinning prowess. Imagine standing in line at the farmer’s market and saying, “Why yes, I did spin the flax for my bag, but it didn’t require a distaff. How astute of you to notice.” (Okay, maybe this is more likely to happen at SOAR.) Brighton will carry a whole summer’s day worth of supplies for whatever life throws at you, be it foreign invasion or impromptu knitting in the park. See Pattern Notes re. yarn substitution. You can easily substitute a commercial sport or DK weight linen, hemp, or cotton yarn. Good substitutes include Euroflax Sport Weight, Hemp for Knitting Allhemp6, Berroco’s NaturLin, or Knit Picks CotLin. Remember that yardage requirements (and gauge) may vary with another yarn. The size of the finished bag will also vary according to how severely you choose to block the lace. I preferred a lightly blocked, rustic look. It’s best to finish the knitting and blocking before buying the lining fabric. While it’s possible to sew the lining by hand, doing so by machine will greatly increase the strength of the bag. Round 1: [K1, k2tog, yo, k1, yo, ssk, k1] to end. Round 2: [K2tog, yo, k3, yo, ssk] to end. Round 3: [K1, yo, ssk, k1, k2tog, yo, k1] to end. Round 4: [K2, yo, k3tog, yo, k2] to end. Repeat these 4 rounds for Bead Stitch. Hold both pieces of knitting with wrong sides together. Using smaller circular needle, CO 112 sts. Place marker and join to work in the round, being careful not to twist. P 1 round. This round forms a turning ridge for the facing. Using larger circular needle, k 5 rounds. Work in Bead Stitch until work measures 13 inches from turning ridge or desired length, ending with Round 4 of pattern. Next Round: K14, place marker, k42, place marker, k14, place marker, k42. Decrease Round: [Ssk, k to 2 sts before marker, k2tog] 4 times. Repeat these 2 rows 5 times more. 64 sts; 2 sts remain between each pair of markers. Next Round: K2tog, remove marker, k to next marker, remove marker, k2tog, remove marker, k30. 62 sts. Slip first 32 sts to smaller needle; 30 sts remain on larger needle. With RS facing, join bottom of bag using Three-Needle Bind Off, working 2 sts together at beginning and end of smaller needle. BO will form a ridge on RS of work. Hand wash in cool water and lay flat to dry. When the fabric is nearly dry, iron bag from the WS, gently stretching lace pattern to desired openness. The more pressure you apply, the flatter and shinier your fabric will be. If you prefer a more textured, rustic fabric, press lightly. Once the bag is blocked and dry, lay it flat and measure its height and width. Double the width of the bag to find its circumference. Cut a piece of fusible interfacing that is 1 inch smaller than the lining in both height and width. Apply interfacing to WS of lining, centering it so that the 0.5-inch seam allowances are not interfaced. Fold lining in half widthwise with WSs together as shown in diagram. Press the fold; this fold will become the upper edge of the lining once it is inserted. Unfold lining. If you wish to sew pockets and add them to the inside of the lining, do so now. Fold in half lengthwise with RSs together and sew along side edge of lining, forming a tube with the same circumference as the bag. Press seam open. Fold half of the tube outwards along the pressed fold line, so that WS of fabric is completely hidden. Sew a seam close to fold line. Lay lining flat and sew across lower (cut) edges, through all 4 thicknesses. Press seam open. 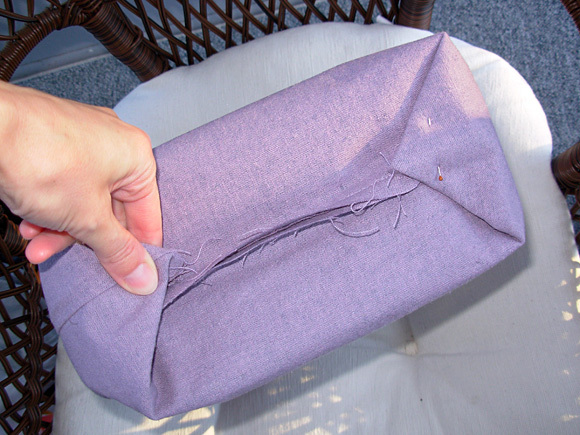 Form gusset by opening bag lining flat, with bottom seam at center of bag bottom. Sew straight across “triangles” at corners, approx. 2.5 inches in from ends. Secure triangles on outside of bottom with a few stitches. Cut Timtex or plastic canvas to measurements of bottom gusset, and cut two pieces of lining fabric that are 1 inch longer and wider than the plastic canvas pieces. With RSs together, sew pieces of fabric together along three edges, forming a pocket for the canvas. Turn pocket right side out and press seams. Insert plastic canvas and sew pocket closed by hand. Place lining inside knitted bag and pin into place. Fold knitted facing to inside along turning ridge and stitch to lining through all layers by hand (use thread to match the knitted bag, not the lining). Sew through all layers around bottom of bag along purl round at beginning of gusset and across ridge of BO. This will ensure that the lining and knitted bag hold their shape. Insert base into bag and tack down by hand. 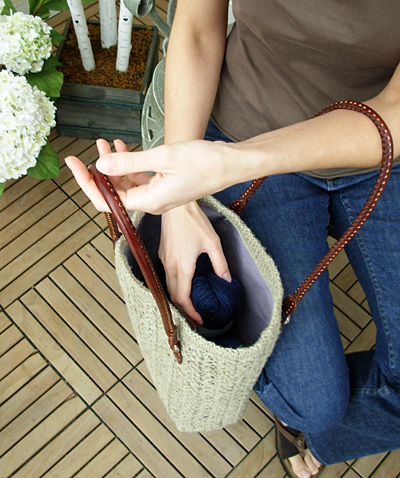 Sew handles to bag through all thicknesses using heavy-duty thread. 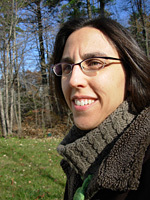 Lee Juvan lives with her family in Vermont, where she carries a large handbag and maintains a small shop at workwoman.etsy.com. 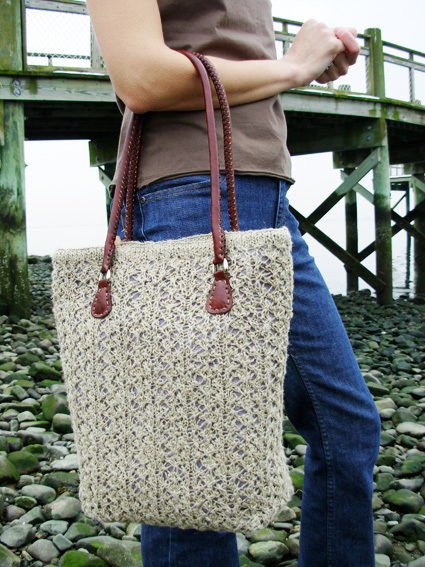 designs will soon be available on Ravelry.